Does an ED measurement of hyperlactataemia (serum lactate ≥ 4.0mmol/L) predict increased risk of organ dysfunction within 24h? Primary outcome: organ dysfunction within 24h of triage time, classified following International Paediatric Sepsis Consensus Conference definitions. Exclusion: patients transferred from other institutions, patients with known inborn errors of metabolism, lactate not measured within 15mins of IV therapy initiation. Results: 239 eligible subjects enrolled (missed eligible rate 36%), of whom 8% were admitted to an intensive care unit. Mean lactate was 2.0 (+/- 1.2) mmol/L. 8% of subjects had hyperlactataemia. 5% of subjects had organ dysfunction within 24h; 4% of the low lactate population, 22% of the hyperlactataemic population. Hyperlactataemia had an LR+ of 5.0 (95% CI 1.9-13.0) for organ dysfunction within 24h, sensitivity 31% (95% CI 13-58%), specificity 94% (95% CI 90-96%). Serum lactate measurement identifies a population at higher risk for severe outcomes than the broader Paediatric ED population with fever and tachycardia and would be a useful addition to clinical assessment in paediatric sepsis clinical and research protocols. As with so many papers, the convenience sampling presents a potential problem in extrapolating this data to our own EDs. While convenience sampling is common, practical and understandable, it does impact the external validity. To their credit, the authors have been honest about this, giving us a “missed inclusion” rate of 36%. This suggests that greater than 1/3 paediatric patients presenting with two SIRS criteria do so in 29% of the 24h period. We can only imagine how including these patients would affect the results. The inclusion criteria are interesting too; I would suspect that many more than 239 patients present to an average PED with fever and tachycardia in 12/12 (particularly as we know that the annual attendance is around 80,000). This means that a large number of these patients did NOT have blood tests. This, of course, represents our standard practice (we don’t bleed every child with a temp and tachycardia), but it means we can only really consider the value of lactate measurement in those children whom we already deem to be systemically unwell. It would also be useful to know if a capillary lactate could help to identify those patients for whom we are not sure whether blood tests are necessary. Despite small numbers, the study was adequately powered by their own calculation. The relative risk of lactate ≥4.0mmol/L for 24-hr organ dysfunction means that patients with an initial lactate above 4.0mmol/L have 5.5 times the risk of 24-hr organ dysfunction as those with a lactate below 4.0mmol/L. They also had 2.2 times the risk of serious bacterial infection, 4.6 times the risk of positive culture and 4.4 times the risk of ICU admission. 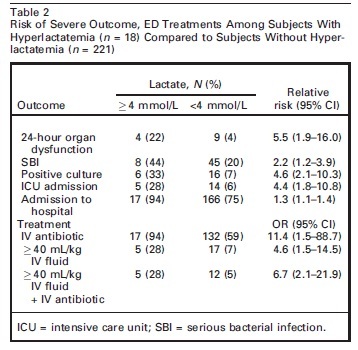 The low sensitivity sensitivity (31% (95% CI 13-58%)) tells us that we cannot be reassured by an initial normal lactate (we are unable to use it to “rule out” serious illness), but the specificity is reasonable at 94% (95% CI 90-96%) – raised lactate should raise our concern. Clinically, a high specificity is more useful to us as arguably it is more important to reliably rule-in serious illness. If we are taking bloods in children in the ED because they have signs of SIRS, a venous lactate may help with risk stratification by predicting those more likely to require antibiotics and organ support. It is probably worth taking one if you are taking bloods, but a normal lactate is not reassuring. It is not yet clear how this applies to children about whom we are unsure as to the need for blood tests. How would the results differ if we obtained a venous (or capillary) lactate from all paediatric patients meeting the two SIRS criteria used in this paper (temperature and heart rate)? How would results be affected if we included children recruited around the clock rather than a convenience sample? This entry was posted in Critical Appraisal on November 23, 2012 by PEMLit.